Kia hopes more seating capacity and a new diesel will boost Sorento sales. MUNICH -- Kia Motors Corp. has engineered the new Sorento to drive more like a car to broaden the appeal of the SUV that will have its European debut at the Frankfurt auto show next month. Kia ditched the current Sorento's body-on-frame structure and designed a new monocoque bodyshell. Panu Vainamo, Kia Europes marketing general manager, said in a statement that the new Sorento's ride and handling have been biased more toward on-road smoothness and comfort without ignoring the current model's off-road capability. He said the new Sorento is meant to be an all-rounder with a much broader appeal." The new bodyshell helped Kia reduced the new models weight by up to 215kg (about 474 pounds) compared with the current Sorento. Less weight helps improve fuel economy. At 4685mm, the new Sorento is 100mm (about 4 inches) longer than the current model to make room for a third row of seats. It is also lower and sleeker and incorporates Kia's new design look. The SUV will be offered in Europe with Kias new 197hp, 2.2-liter diesel, which is linked to either a six-speed manual or six-speed automatic transmission. 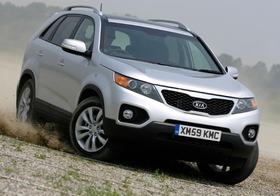 Last year, Sorento sales fell to 16,817 in Europe from 28,756 in 2007, according to market researchers JATO Dynamics.